Luxurious accommodation situated in a quiet private residential area a few minutes drive or gentle stroll from the historic town centre and world famous Old Course golf course. Visit Crail Fife and the surrounding villages and stay in bed and breakfast, hotel or holiday home accommodation provided by BedPosts members. Crail is the easternmost of the little fishing villages which huddle on the East Neuk's rocky coast. It has plenty of Golf courses, and together with the picturesque harbour with its old crow-stepped red-tiled cottages which were once the haunt of smugglers, makes this fishing village a popular tourist resort. There is a fine Tolbooth with a guilded copper salmon for a weathervane and an interesting 13th century Collegiate Church which contains an 8th century carved cross. Two miles south west are the Caiplie Caves, one of which is 40 ft in length. 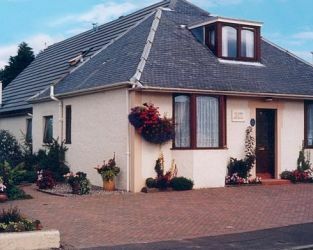 If you seek accommodation near Crail in Fife you have come to the website of a “club” of providers who offer affordable quality accommodation around UK in hotels, bed and breakfasts, guesthouses, inns, and restaurants plus self-catering cottages and apartments .